When Stanford Professor Mark Jacobson wanted an energy-efficient home that he could customize to his liking, he set his sights on the Quebec-based company BONE Structure. The designer and builder of luxury custom homes recently delivered on the professor’s request for a net-zero solution with the completion of a beautiful 3,200-square-foot home that not only meets California’s 2020 Zero Net Energy (ZNE) new home building requirements, but is also seismically resistant and made of 89 percent recycled steel. The key to Professor Jacobson’s new net-zero home is BONE Structure’s innovative and lightweight steel frame system laser cut in a factory and delivered for on-site assembly. 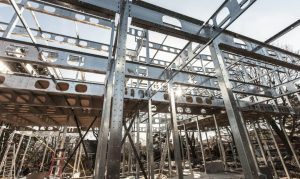 “The steel frame system allows for exciting design features that would not be possible using traditional building methods,” said Professor Jacobson. “Interior spaces and window lines can run up to 25 feet between columns.” The building’s “net zero ready” shell is designed to produce near zero waste and is 100% recyclable, earthquake-resistant, and impervious to mold and termite damage. The shell of a home can be assembled in just days using a battery-powered drill. Precut openings in the steel structure allow for easy installation of electrical, plumbing, heating, and ventilation systems. Precut insulation panels slot between the steel columns and the shell is further sealed with spray-on polyurethane foam insulation. The net-zero home is powered entirely with electricity and includes Tesla Powerwall energy storage, the Tesla Wall Connector auto charger, a 15kW solar system, and the Nest Learning Thermostat. BONE Structure has plans to scale up to produce 1,000 residences per year. The net zero energy-ready homebuilder expects to complete 50 more homes in California in 2016.